This is another new theme for the Small Layout Scrapbook. we have enough, we’ll publish ’em. Here’s our first collection. Nelson Almeida, from S. João do Campo, Portugal, made the normally-hidden fiddle yard — a turntable — the center of his On18/O9 clay operations. 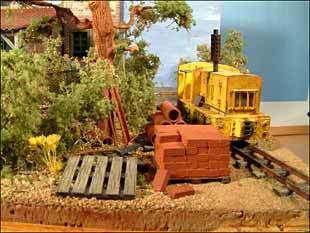 He named this 30x30cm layout Carl’s Clay Works, an honor we appreciate! Nelson has compressed a whole industrial operation into one square foot. Raw clay comes in from the pits on the second-from-left track (at right) and is delivered to the works on the right-hand spur. Finished product is loaded there and delivered to the loading area (left spur) where final product is loaded into trucks. Fourth track is a repair track. 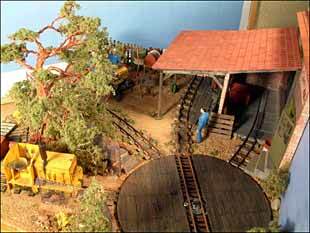 In my Peek’s Pike On30 layout, I introduced the idea of using a Peco Loco Lift* as a movable cassette to shift trains and cars around the fiddle yard. 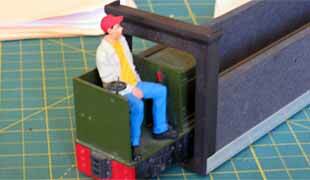 The Lift provides an easily manipulated carrier and was originally designed for OO and HO scale use. 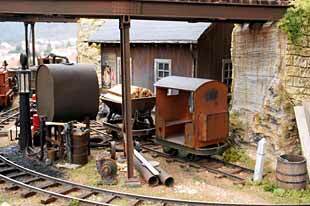 Small On30 narrow-gauge trains will fit, if you choose your rolling stock carefully. 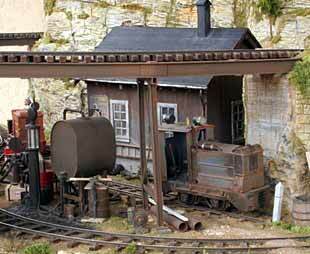 But larger scales using HO gauge, like Gn15 (left photo above), will not fit! Ian Holmes, from Princeton Minnesota USA, has solved that problem neatly(at right). Notes Ian, “I just raised the height of the arch 30mm to clear my tallest stock by cutting the arch and inserting some 57mm lengths of 3.5mm square styrene. That length means they don’t obstruct the foam sides that protect the stock.” For more on Ian’s Purespring Watercress layout, see his website. 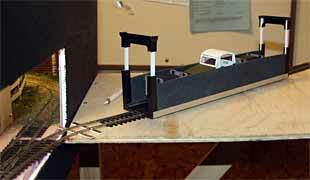 * Although I independently developed the idea of using a Loco Lift as a cassette, I’ve since been informed that I was preceded by at least one British modeler, Paul Lunn, in a book called “Model Railway Planning and Design Handbook”, published by Santona Publications in 2004. 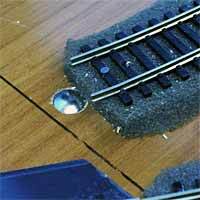 AND STILL MORE FIDDLE YARD TIPS! A continuing question in fiddle-yard construction is “How do you index the sector plates and transfer tables to stop at the right place every time?” There are lots of answers, but here are two particularly useful ones. 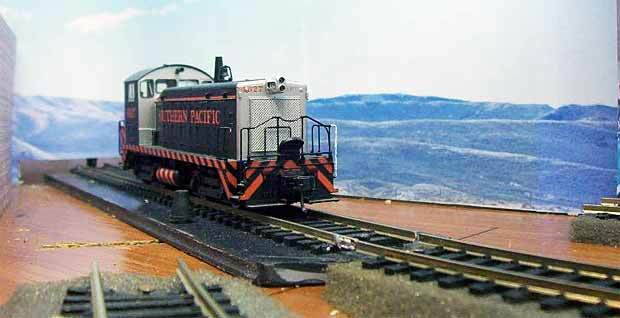 Marcelo Szkatulak, who lives in Toledo, Spain, has developed a clever system for indexing the sector plate (pictured above) on his Patagonia Yard layout. Marcelo uses a bicycle brake cable to move the plate from behind the scenes, and he describes his indexing this way: “I made a hole with two diameters. The big one receives a spring that presses against the back of a screw head. The screw threads under the table are used to regulate the height. I made a cavity in the bottom of the sector plate, so the screw’s head would fit… When I move the cable and the sector table catches the index, you can hear a smooth “click” and the rails are aligned for the locomotives and wagons. The heavier the locomotive or car, better is the precision.” The photos and diagram below show Marcelo’s installation. Another “hands off” method for aligning sector plates (and transfer tables) was suggested by Jack Trollope, from the Highlands of Scotland. Jack’s drawing (at left) pretty well sums up the idea. A small brass tube is soldered to the outside of one rail on the sector plate (at the right). A bicycle brake line is attached (using an electrical connector) to a length of piano wire alongside the matching rail on the layout table. Pushing and pulling the cable allows the operator to move the piano wire in and out of the tube, precisely aligning the two tracks. In this system, the weight of the rolling stock does not influence precision of alignment. 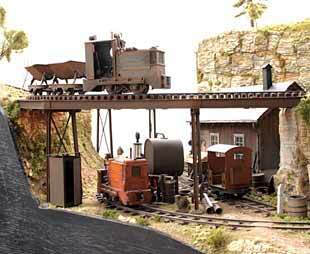 Frequent contributor Alexander Lehmann, from Mannheim, Germany, is building this HO micro layout called Rainer’s Quay. 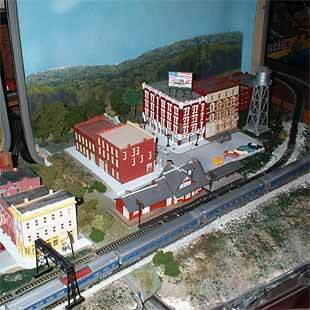 It’s a waterfront scene with a narrow-gauge railway serving both the ships and the warehouses on the docks. The scene is heavily influenced by Alex’s visits to Amsterdam. He describes the layout’s construction this way: “It’s a horizontal folding layout with a vertical hinge right in the middle. 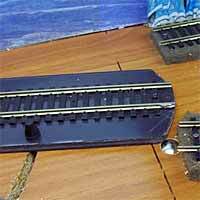 The baseboard is 72×12.5cm (28x5in), enough space for three parallel tracks in TT-gauge or two in H0. The switches are positioned completely on either one or the other of the halves.” So the layout folds up into a 14x5in bundle that you can carry under your arm! I hope to show more of tiny Rainer’s Quay as construction progresses. The layout is dedicated to Alex’s father, who is the origin of its name. 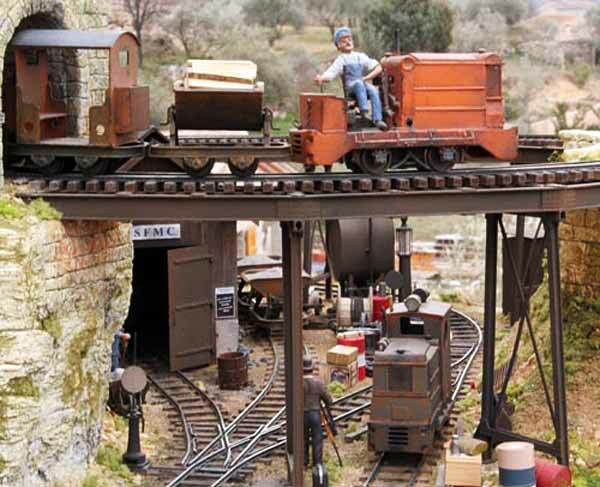 Roger Humbert, of Nice, France, is building a layout that’s unusual in several ways. 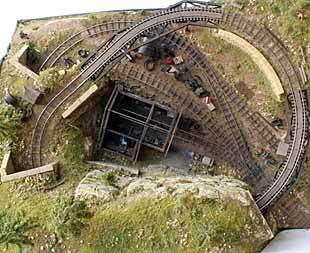 He’s building it in Sn3 scale, which is even rarer in Europe than it is in the U.S.; and he’s using an “out and home” track plan, which is seldom seen in very small layouts. And to top it off, the operation is fully automated and computer controlled! The layout measures 3x2ft (90x60cm). Rail is code 70, 8-inch radius and a steep 7 percent grade. Roger’s example is inspiring. I’d also like to hear from any other folks who have applied computer controls to small layouts. THE RETURN OF THE PUZZLE LAYOUT! Brian Neely, from Fairway Kansas USA, doubled his pleasure by using two suitcases to build Wyandotte, his more or less portable N-scale railroad. The suitcases are old Samsonite hardshell cases, virtually indestructible. The larger and taller buildings are removed before the suitcases are closed for traveling. Two full ovals of Bachmann EZ Track (they join behind the cases) and a switching spur on the lefthand unit keep Brian and his three grandchildren busy and happy “running trains.” Below are some more pictures showing most of the more than 30 structures on the layout. Don’t those photographic backdrops look great? The gauge appeared to be about 11/32in, so Bruce decided to call it On16. “Over the battery powered chassis I scratchbuilt a small 0-4-0 critter. I mounted the track panels to a piece of foam board and surrounded the panels with a couple of inches of 3/16in balsa. Then with a saw cut it to the final shape, overall baseboard size is 8-1/2x19in. Here are the track panels currently available for XTS Train Systems. If you make something from this idea, please take pictures and let me know! 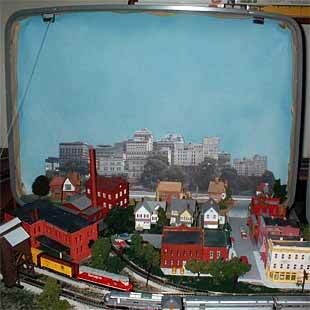 On the subject of mass-produced trains, I’m often asked whether it’s possible to build micro layouts using O scale three-rail equipment or S scale American Flyer style trains. The answer is an emphatic YES! 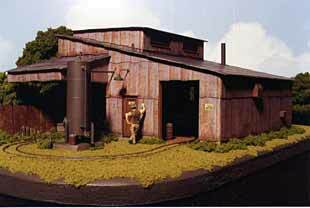 I’m interested in hearing your ideas for using high-rail or tinplate equipment on very small layouts. To start the ball rolling, here are two of my designs that actually fit on 48x12in (120x30cm) shelves. They’re both versions of the classic shoebox design, Carl’s Imports, found elsewhere on this site. Here’s an O27 gauge three-rail version. A 17in (43cm) sector plate is concealed within the large building at the left. Using 40ft freight cars, it should be long enough to hold a small switching loco and one car which is perfect for this little line. The problem seems to be that there are no small switching locomotives available! 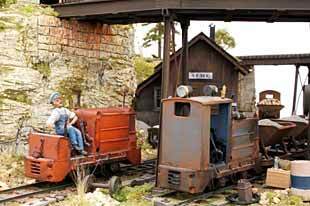 One thought is to scratchbuild a body on the four-wheel power truck from a handcar or speeder offered by several manufacturers. Or perhaps a four-wheel trolley mech could be adapted. 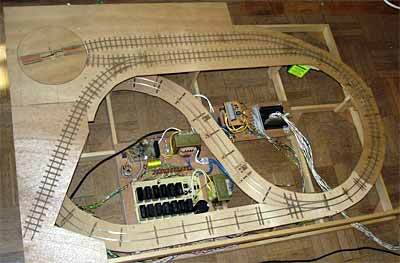 An S-gauge version might look like this one, designed for S-Trax trackage (or for American Flyer, which has the same geometry). The 15in (38cm) sector plate should hold one of the small SW-series diesel switchers now available, plus one 40ft car. Operation is as described for Carl’s Imports. 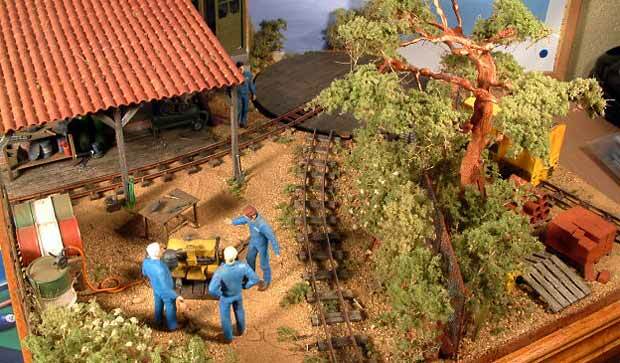 This particular layout was designed to hook onto a larger S-gauge pike, connecting at the upper right corner. For those considering moving from high-rail to scale modeling in S, here’s the track plan of Fabrice Fayolle’s new layout now under construction. 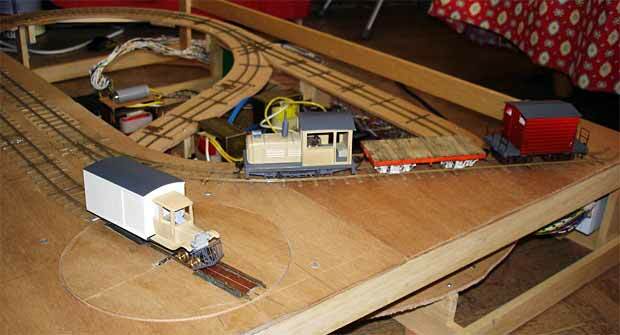 Fabrice, from Amiens, France, is building this industrial switching layout on a slightly larger bookshelf. Well-known European modeler Gilbert Gribi, who lives near Lausanne in Switzerland, sent me these photos and plan of his classic micro layout, Draversaz. It was built in the mid-1990s, and may still represent an “ultimate” in shoehorning plenty of operation into a very small space! 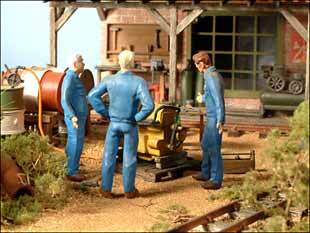 The layout is built on four levels in On2/Oe14 scale (7mm to the foot on 14mm gauge) and measures 60x45cm (24x18in). 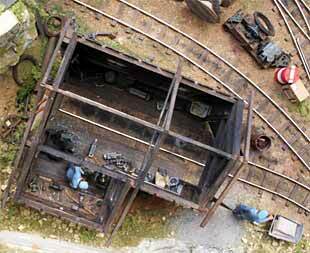 Heart of the layout is the concealed lift/elevator (above left) that cannects all four levels — from the hidden fiddle yard at Level -1, up to the top two levels that provide access to an offstage dam under construction, served by the rising track loop. 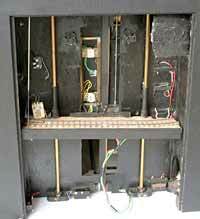 The elevator slides up and down on two rods and is driven by a toothed belt mechanism from an old Olivetti printer. It is “called” by micro-reed sensors hidden in the ballast at each level. Several security interlocks prevent the locomotives from running into an empty shaft. 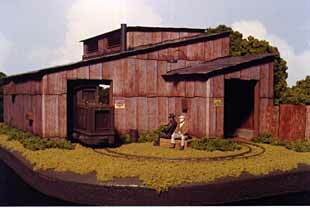 But even more impressive is the scenic work — Gilbert’s specialty. The photos below speak for themselves. To see more of Gilbert’s work, visit his website. In addition you can find a detailed description of Draversaz in the French modeling magazine, Voie Libre, issue #3 (April 1998).